If I meet you and you add me to your mailing list without asking my first, I’ll be annoyed but I’ll give you a few emails to show how you add value to my life. But if we’ve never met and you’re sending me unsolicited email, I don’t like you. It’s because of people in the latter category that I’m glad we have the CAN-SPAM Act. The CAN-SPAM Act is a federal law for sending ads via email and text messages. It says you can’t use false header information or deceptive subject lines and you have to identify your message as an advertisement. This law also requires you to make it easy for people to unsubscribe from your list. The instructions for unsubscribing must be clear, conspicuous, and easy for an ordinary person to recognize and understand. This law is easy to follow, which is probably why I find it so annoying when companies violate it. The biggest mistake I see people make is creating a mailing list without and unsubscribe option – usually because they don’t use a service like Mail Chimp that has this option built-in. What’s the worst case scenario if you violate this rule? A $16,000 fine per email you send in violation of this law. So what can you do if you’re getting spam email and you want to report the person? Forward the spam email to the Federal Trade Commission at spam@uce.gov. Their site On Guard Online has some other useful tips for managing and reducing the amount of spam email you receive. Unfortunately, the friendly corrective message doesn’t always work. Recently I received 7 unwanted unsolicited spammy advertisements from a company that claimed to be member of a business organization I belong to. I let it go initially because the association itself is awesome, as are the majority of other members I’ve met at events. But then I heard through a trusted source that this company is continuing this behavior despite being told to stop. (They allegedly claim that what they’re doing isn’t wrong.) If they won’t listen to reason, perhaps they’ll listen to the feds. I forwarded all 7 emails to the FTC. Hopefully that will fix it. I’m all for people behaving properly online. If you want to chat more about this topic, please contact me directly or connect with me on social media via Twitter, Facebook, YouTube, or LinkedIn. One of the perks of being a blogger is sometimes you get free stuff. Companies will send you free things with the hopes that you’ll write about it. One of my writing gigs is product reviews for lawyers so I have to use various office gadgets and software and write about it. Your review of the product must contain your true opinion about it that is not misleading. You must disclose when you are compensated for giving your opinion. If you don’t follow this rule, you could be fined up to $11,000 by the Federal Trade Commission. They can go after the reviewer or the company who sent the product. I suspect they’ll go after who has money to pay the fine. A company that sends out free products to bloggers or reviewers should include a reminder to their reviewers that they need to comply with this rule. This rule also applies if you’re writing comments on other blogs or websites or writing original content for your own site. This rule also applies to review sites like Yelp and Trip Advisor. If you’re a Yelper, your must only post accurate reviews and you can only review products and services you’ve used. A company can’t legally tell its employees to post exaggerating positive reviews about the company or fake negative reviews about their competition. 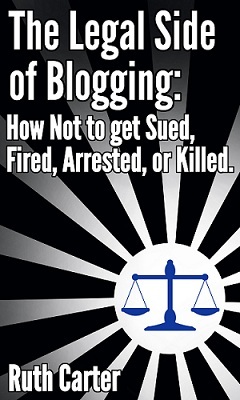 If you need a legal resource on this topic or anything related to the laws that apply to social media, I recommend my book, The Legal Side of Blogging: How Not to get Sued, Fired, Arrested, or Killed. It covers a lot of the major issues that apply to copyright and the internet. If you want to chat more about this topic, feel free to connect with me on Twitter, Facebook, YouTube, LinkedIn, or you can email me.